Grooming is only one part of pet's cleanliness. Keeping them clean and looking good can be relatively simple, but cleaning the area where the live can be more difficult. You'll find some great tips in this section that can help you get rid of the pet hair all around your house using a variety of methods. There are also some tips about keeping pet odors under control and how you can remove smells from your pet. The following articles are available for the 'Grooming' topic. Click the article''s title (shown in bold) to see the associated article. While pets can be cuddly and fun, sometimes they don't always smell the best. By using brewer's yeast, you can succeed in combating that pet odor and winning! Whether you have a dog, cat, or some other kind of pet chances are pretty good that you will want to have your furry friend look their best. That is when you start looking for a pet groomer. Finding a good pet groomer, it may seem tricky at first, doesn't need to be. When pets shed, it can be really annoying, and often there's nothing you can do about it. While sometimes you may be at a loss for how to reduce the hair spreading all throughout your home, there is a way to at least reduce the amount of hair that gets on your furniture and clothes. When pets run around, they pick up unwanted material that can track everywhere, and get tangled up in the pets' coats. So, if your pet is in that predicament, here are some tips to get rid of burrs, tar, or paint from fur. It's always a possibility that your pet will come home one day smelling just disgusting, the causes of which being varied and possibly unknown. If you have to deal with a pet coming home smelling of not-so-great things, then you can use tomato juice to remove those smells. It's always a possibility that your pet will come home one day smelling just disgusting, and the cause of that smell could very well be skunk. 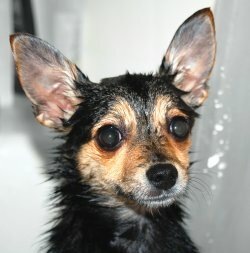 If your pet is victim of a skunk smell attack, then here's a recipe to remove that skunk smell.